A wonderful verse - it says all we need! Thank you for sharing. Wishing youj and your family a Happy Easter as we celebrate our Risen Saviour. Thank you for posting this verse.Happy Easter blessings to you. Happy Easter to you, too, my blog friend! Wishing you and yours dear Rosemary, a very blessed EASTER SUNDAY too! Lovely angel. 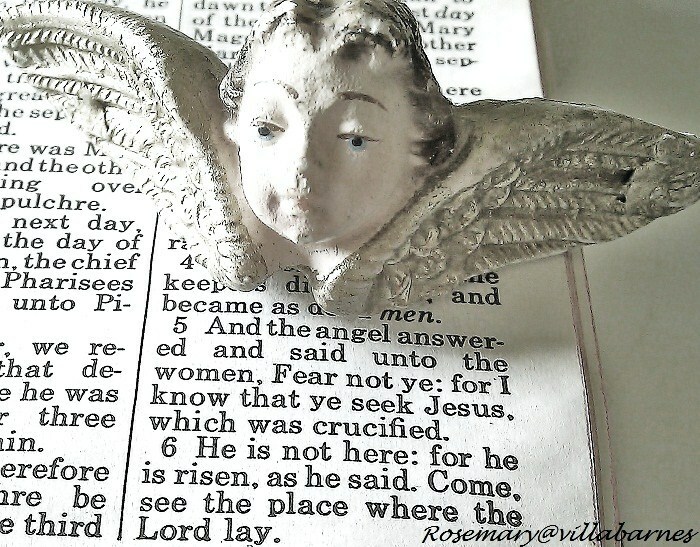 perfect image, Have a wonderful Easter, Rosemary! Beautiful verse and perfectly appropriate for Sunday and always. Many blessings to you this Easter. Thank you for reminding all of us....have a blessed Easter, friend! So beautiful - love this! Beautiful post Rosemary. One of my very favorite verses of the season and always so in awe of this message. Happy Easter to you and your family. a blessed Easter to you and your family! Thank you for reminding us of the true meaning of Easter! Beautiful! love this post....and my risen Savior!!! Happy Easter, just having had a jubilant service I thank God for His Mercy every day. What a Savior. Lovely verse for you to post. Thanks. HE IS RISEN! ALLELUIAH!!! Happy Easter, Rosemary! I hope you've had a blessed day!!! Happy Blog Anniversary too! Hope you had a lovely Easter and congrats on your one year blogging anniversary too! Félications! You are the winner of the Obee Designs Pillow Giveaway over on the blog. If you would be so kind as to email your address info, we'll get that out to you asap.